1917 is an important year in the life of the school. It marks the year of adding the Smith-Hughes program to the Vocational curriculum. The additional government funds provided by the Smith-Hughes Act, allows the school to increase enrollment and it quickly becomes obvious that a larger building will be needed. The school begins to use the "Jefferson Annex" due to over-crowding. 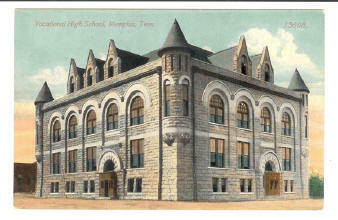 The Vocational School appears on "penny postcards" of the time. 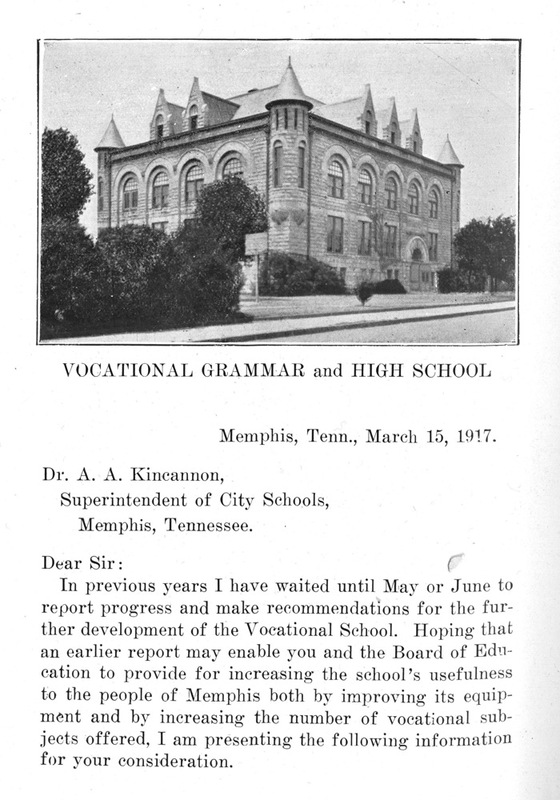 This rare photo appears in the Board of Education 1906-18 Yearly Progress Books > It's a letter from the Superintendent Andrew A. Kincannon, who became President of Memphis State in 1918. Below: A 1917 article about the association with "Smith-Hughes". When the Smith-Hughes curriculum became part of the school at 317 Poplar, the building quickly became too small, leading to the new Tech building at 1266 Poplar. Below: A 1917 article describes the June graduation program.